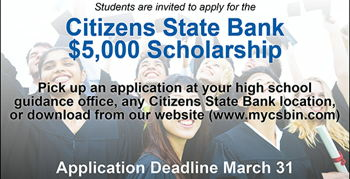 Applications are available for the Citizens State Bank $5,000 Scholarship. You can download now, visit your high school guidance office, or any banking center location. The deadline is March 31. Good luck to all who apply!